I don’t think anybody needs selling on the sweet and tart taste or juiciness of pineapples, but you might need a brief refresher on their health benefits. Pineapples are exceptionally high in vitamin C and manganese, and are a good source of dietary fiber, vitamin B6, copper, vitamin B1, and folate. 1 cup of pineapple has a mere 82 calories. This smoothie is great for dessert or as a snack. If you want something a little more substantial incorporate in a few of the add-ons. Now for the tropical smoothie that will tickle your taste buds. Enjoy! Place the ingredients into your blender and blend for around 45 seconds or until your desired consistency is reached. 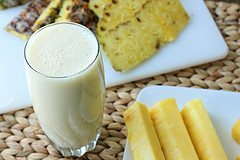 Try this topical pineapple smoothie or a recipe like it? Leave a comment below and tell me all about it. Cheers! Delicious! added some chia seeds and some strawberries and spinach to bulk it up a bit and I looove it! going into my regular rotation!